The Dynamic Shortcodes Extension for W3 Total Cache enables you to choose certain shortcodes to keep dynamic, while the rest of the page is cached. This can be useful if you have shortcodes that display geo-localised content or time-based content e.g. eBay listings ending in the next 10 minutes, for example, but want to take advantage of W3TC’s page caching to speed up your website. For an explanation of why caching can be problematic with dynamic content, and how dynamic caching / fragment caching (used by this extension) compares to other methods, please see this page: Differences between caching methods with Geo targeted content. Version 0.9.5 of W3 Total Cache significantly changed the way extensions are handled. Instead of a Extensions folder within the W3TC plugin directory, extensions are installed the same way as normal plugins. After doing this you also need to activate the plugin / extension. Note that activating the extension from the WordPress plugin page doesn’t activate the extension, it just makes it so that the extension will be able to register itself with W3TC. Actual activation of the extension is done via the W3TC extensions page (see Using the extension). To install the extension, unzip it, then upload the contents to the W3TC plugin’s extension directory ( typically wp-content/plugins/w3-total-cache/extensions/ ). Note that depending on your unzip software, it may unzip the files into a folder with the same name as the zip. If so, it is the file and folder inside that folder that need uploading to the extensions directory. Please deactivate the extension, install the new version, then reactivate the extension. You may want to clear the cache after activating the new version. On the W3TC General Settings page, under the Page Cache section, Page cache method should be set to Disk: Basic. On the Page Cache page, under the Advanced section, enable Late initialization. If you want the user to see the dynamic output of a shortcode whenever they refresh / revisit the same page, then you need to disable browser caching. This is unlikely to be needed for most people, but if you do need this, then go to the Browser Settings page. Find the HTML & XML section, and enable Set cache control header. Set the Cache Control policy to no-cache ("max-age=0, private, no-store, no-cache, must-revalidate"). On the W3TC Extensions page, activate the Dynamic Shortcodes extension. Then click on the Settings link underneath it. This brings you to the extension settings page, where you can select which shortcodes you wish to make dynamic. After you’ve saved the settings, you’ll need to clear the W3TC cache so that pages will be cached with the dynamic shortcodes. Some plugins don’t register the shortcode when you are viewing an admin page, hence the extension can’t find the shortcode to pick it up. In this case there is a field at the bottom of the shortcodes list, where you can manually type out the shortcode tag name(s) to make dynamic. There could also be other reasons for a shortcode not showing up. 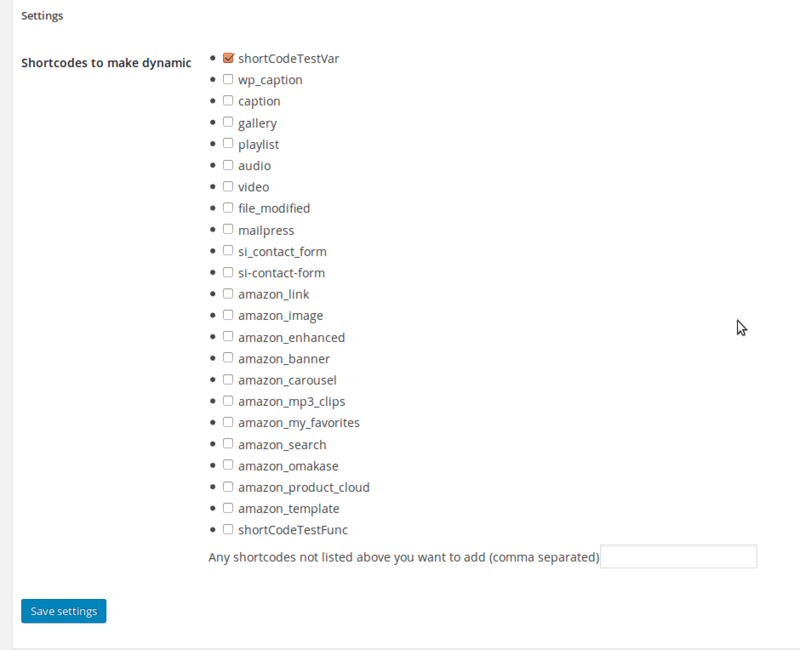 If you find that some shortcodes are missing from the list, please let me know the theme / plugin that adds that shortcode, and the shortcode tag, and I’ll try to see why the shortcode isn’t being picked up by the extension. The first thing to check is that you’ve cleared the W3TC cache, and also your browser’s cache, to ensure you’re looking at a page where the dynamic shortcodes extension is active. Secondly, check that the shortcode works and is dynamic without W3TC page cache enabled, as the problem could be with the shortcode itself. If something doesn’t work or if you have any suggestions for improvements, please do let me know. You can leave a comment below, email me on info@, or send me an email via the contact form. Extensive modifications to enable the extension to work with W3TC 0.9.5 and above. Fixed a bug on the admin page where adding a shortcode(s) by text input and checking / unchecking shortcodes from the list only saved the new manually input shortcode(s). Previously the extension didn’t work if you had HTML minification enabled in W3TC. Now it does. Dynamic Short codes extension is only W3-TC Pro version or can I use it with free version of w3-TC plugin. It works with the free version. anyway you could update this to work with last version of W3TC? Do you have plans to update your extension for W3TC .9.5.1? At some point, but I’m afraid updating my free plugins isn’t a priority at the moment. Hopefully sometime within the next month, but it all depends on whether I can find the time (and how complicated the update is). I’ve now updated the extension to work with W3TC .9.5.1, however there is also a bug with W3TC .9.5 that needs fixing for the extension to work properly, see Installing current version for W3TC 0.9.5 and later for details. Hello! Thank you for this great extension, I did all the steps but how to I integrate the short code in the php file where I want to display it? If you did still want to use this extension for some reason, you’d just include the shortcode for processing in the PHP the same way you would normally, e.g. also, I mean can I add setting_RQ_cookies and make it dynamic as well? I’m not sure without testing it. Generally shortcodes that rely on an action won’t work with this extension because the cached page is loaded before most actions occur. However, the init action may happen before the late init cache retrieval kicks in. I would test it myself to check, but I’m afraid I’m just too busy with other work at the moment. Actually after adding this extention it works fine for the first time. but after that it unable to resolve the php code within the cached version of the file. Did someone solved this issue? Really appreciate if someone has found an issue!